Carousell is a mobile-first C2C marketplace for buying and selling new and secondhand goods. I joined the team as a product designer, then transitioned to a product manager role. I’ve worked on a variety of user journeys, including monetisation, growth markets, and seller experience. Want to know more about what I do at Carousell? Ask me out for coffee or beer! ReferralCandy is an online SaaS product that runs refer-a-friend programmes for ecommerce stores. I’m involved in the entire design flow, from user research, data analysis, interaction design, to metric tracking and even pushing code to production. 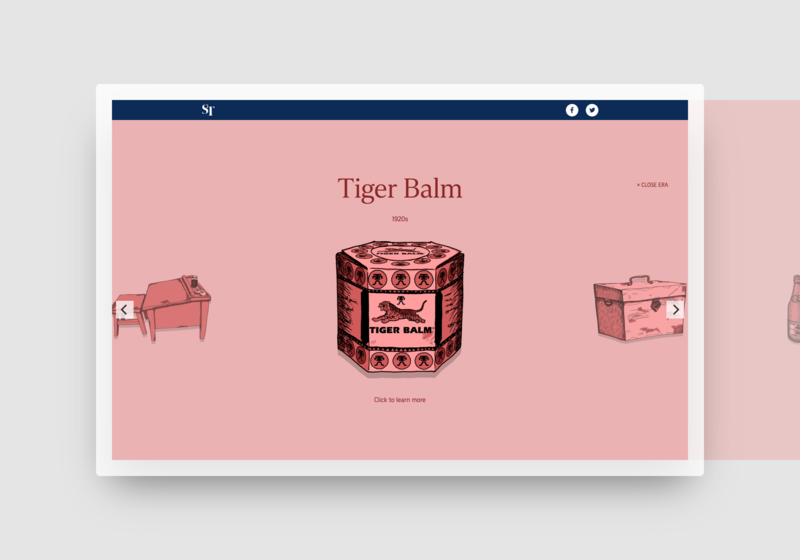 I worked on CandyBar, our latest product: a digital loyalty card programme for brick-and-motar stores. Want to know more about what I do at ReferralCandy? Ask me out for coffee or beer! Mothership is one of Singapore’s largest non-mainstream media company. Their witty content and tone of voice earned them massive followings on social media, but their brand and website design were starting to look dated. They wanted to refresh their looks to captivate not only their audience, but also potential business partners. 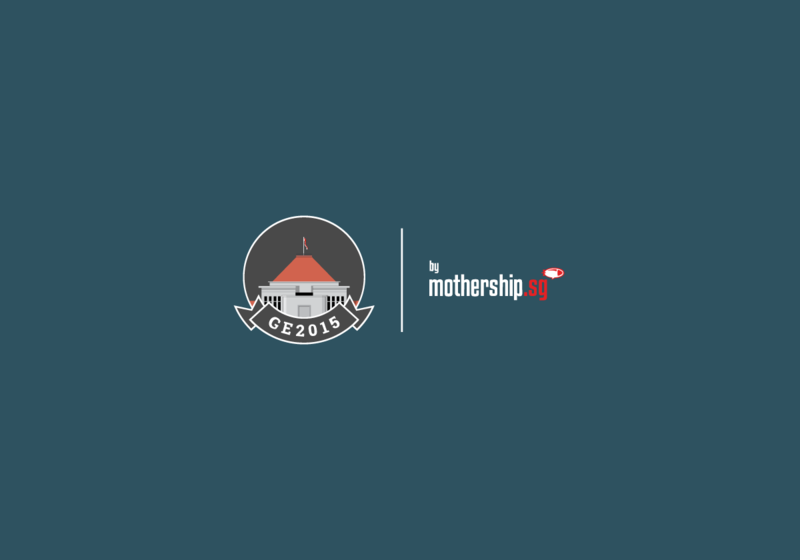 We knew that Mothership had to look both professional to their business partners, but yet also retain the playful vibe that they’re known and loved for. We retained Mothership’s iconic blimp logo, but put a modern spin to it. The hidden smile in the logomark further preserves the brand’s playful spirit. On their website, we let the content speak for itself. We chose layouts and font pairings that are clean, and that maximises readability. The Straits Times, Singapore’s largest news agency, wanted to celebrate the nation’s 51st year of independence. 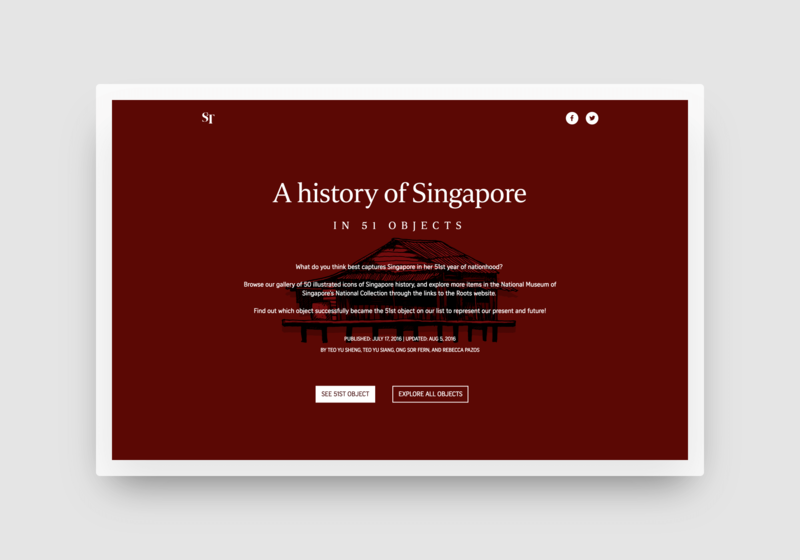 They approached us with an idea for a microsite: 50 objects to represent Singapore’s history, and 1 new object — to be voted on by their readers — to represent the nation’s future. We had to showcase a staggering 55 objects to the agency’s attention-starved online readers. 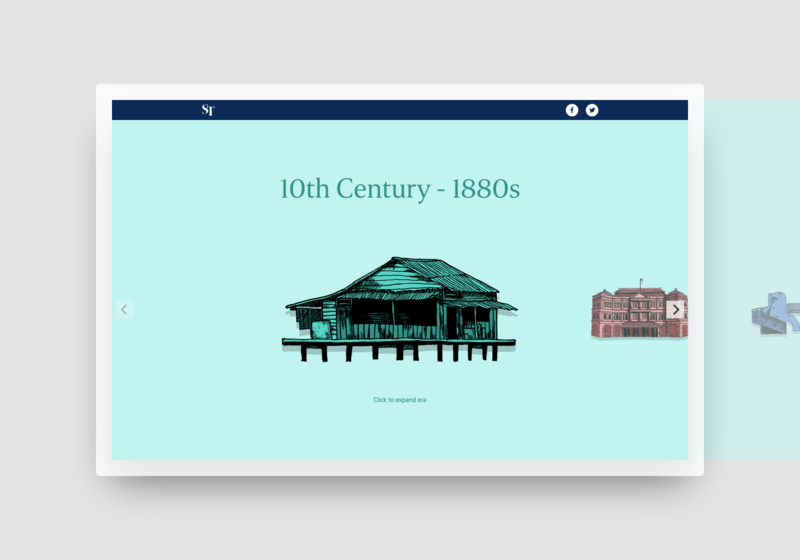 We sliced the first 50 objects into 5 distinct eras of Singapore’s history. By framing the objects into sets, their context in history becomes more firmly rooted. Readers could also easily find the years of their childhood and adulthood, making some objects more intimate and relevant to them. The hand-drawn illustrations add salience to the entire collection. 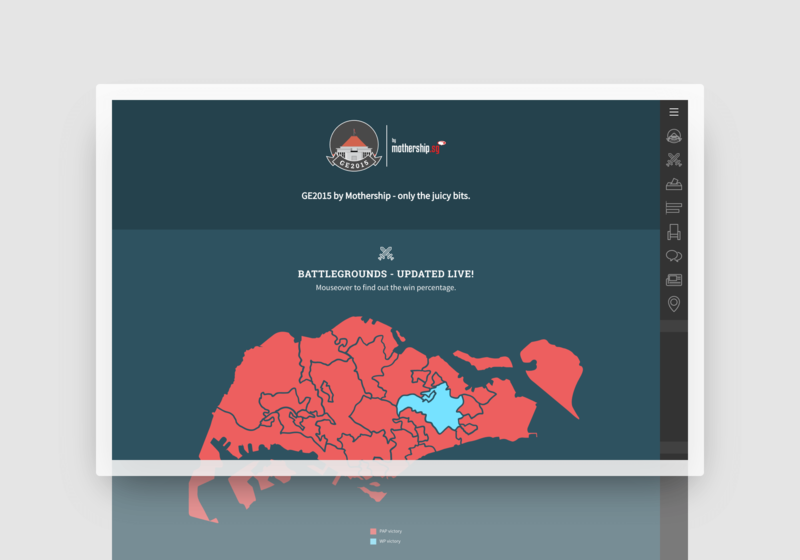 In less than a month’s time, over 9,000 people voted for what they think best represents Singapore’s 51st year of independence. 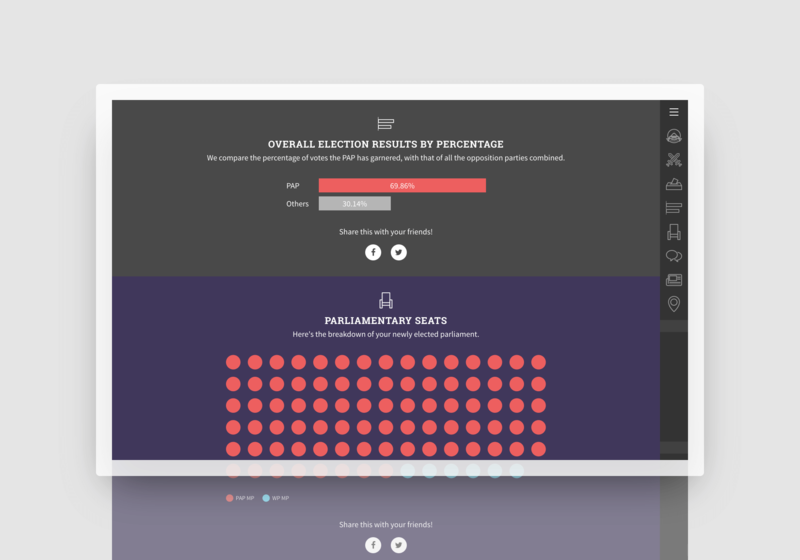 Every five years, Singapore holds its general election. 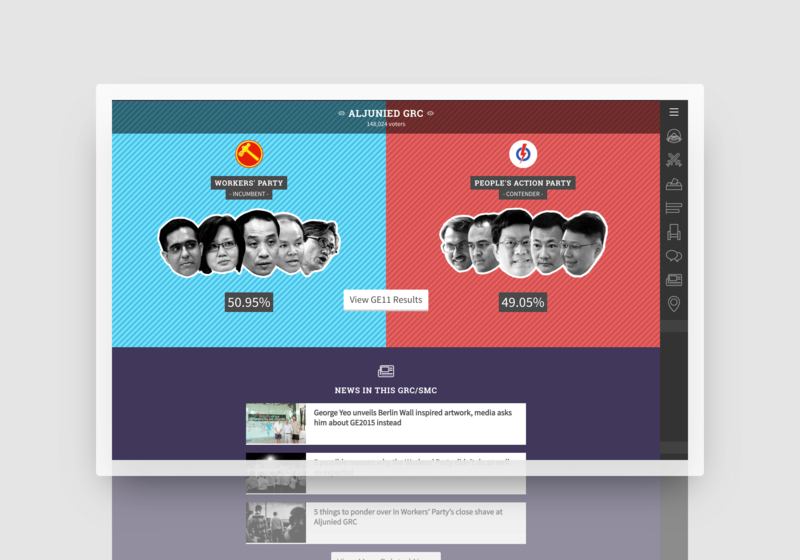 In 2015, Mothership.sg — the nation’s most popular digital news site — approached us to help them create a microsite for the nation's 17th general election. Time was, in many ways, really tight. We had only 2 months before the election season kicked off. On top of that, we had very short turnaround time to update the site during Nomination day (when candidates for all parties are revealed) and Election day (when votes were counted and announced). We met up with key stakeholders early in the process, to nail down the direction and objectives of the site. 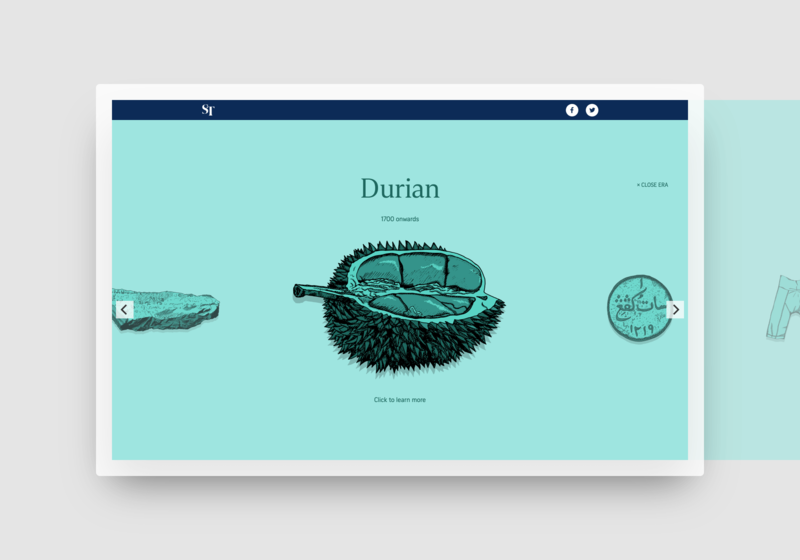 With that in mind, we designed a microsite that visually stood out and was easy to update, and devised workflows that fit into their writers’ existing workflows. 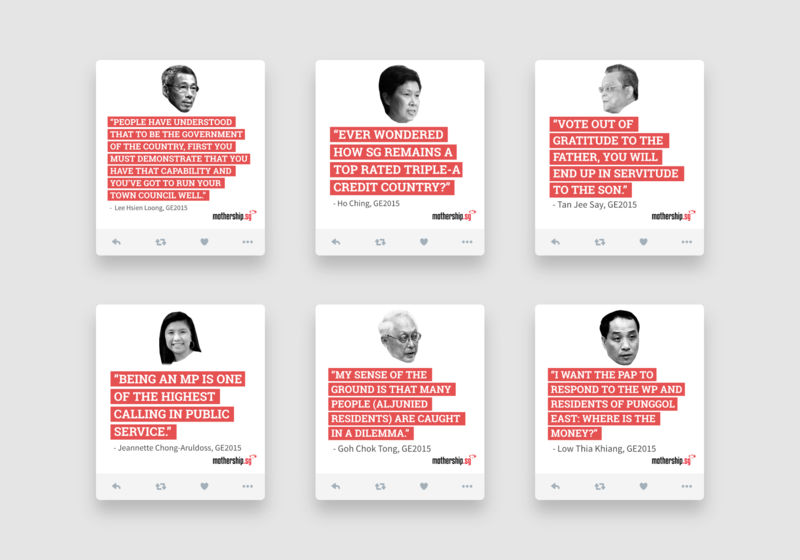 Our striking visual direction and tone allowed Mothership.sg to stand out from their peers during the election season. Their GE2015 coverage earned them praises and boosted their reputation as the nation’s favourite digital news site. Season 6 of Game of Thrones was about to air, but there wasn't an easy way to recap the plot of the entire 5 seasons thus far. 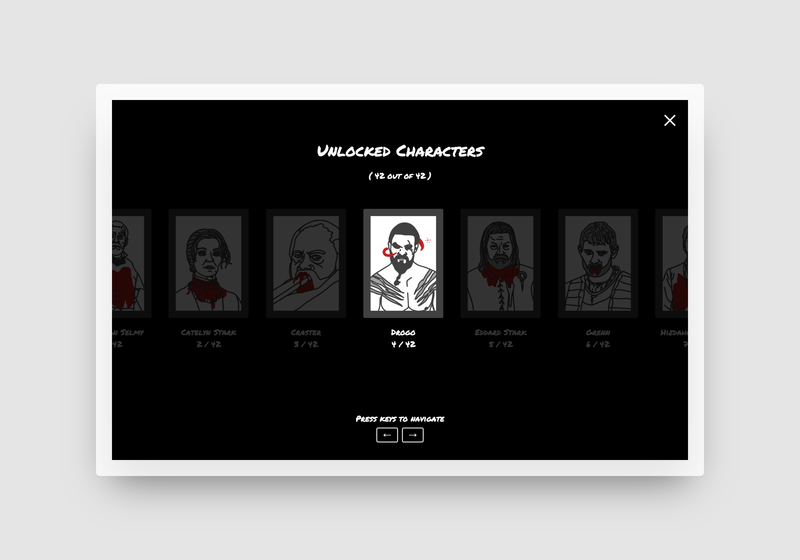 Since deaths are the landmark events in the series, I decided to create a game that forces players to recall the storyline as they pick the characters who died first. For the game to be playable, each character has to be instantly recognisable. Photos, while being the obvious choice to represent the characters, will also make the game visually dull. 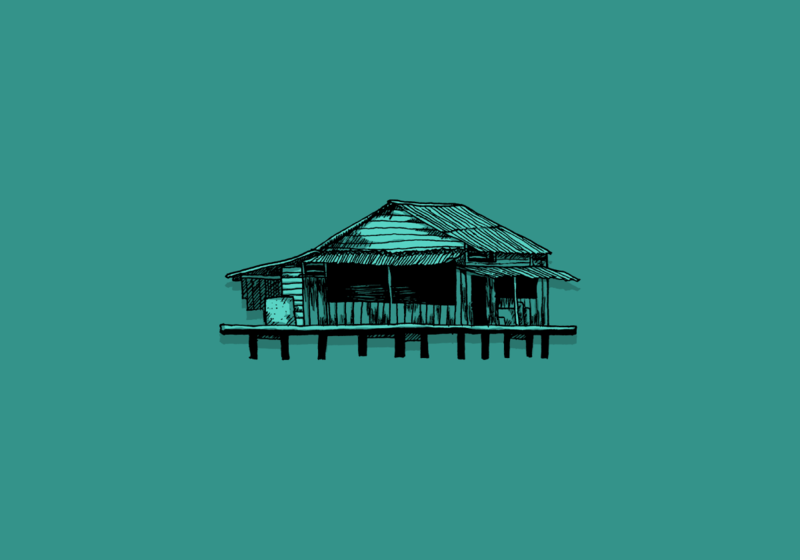 Illustrated GIFs. 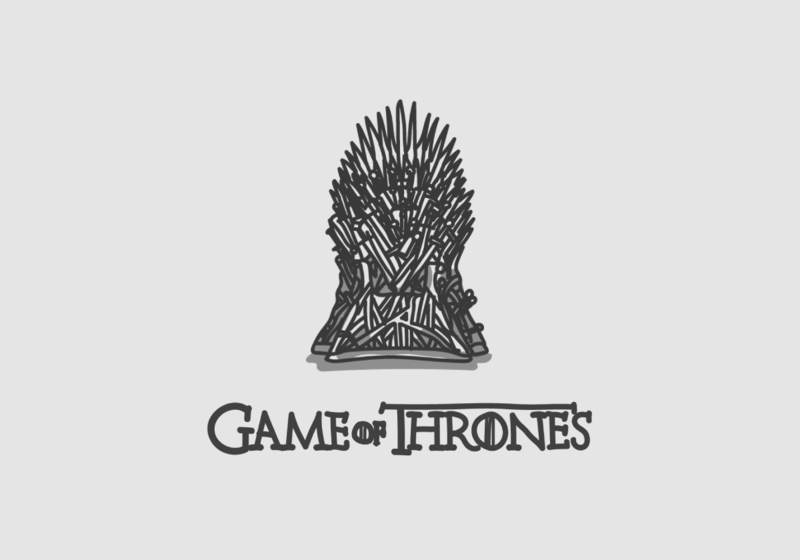 They’re wacky, engaging, recognisable, and has the added bonus of depicting the way each character dies in the series (except maybe for Joffrey, but he had it coming). The game was shared by Westeros.org (the biggest Game of Thrones fan club), featured on Coconuts Singapore, and reached over 30,000 views in a day. And then my server crashed from the traffic. No pair of cards is shown to the player twice. To achieve that, each generated pair of cards will first be matched to an array containing all previously matched cards, before being shown to the player. If a pair of cards has been shown before, the cards are re-generated. I’m a Product Manager / Product Designer at Carousell (previously ReferralCandy). 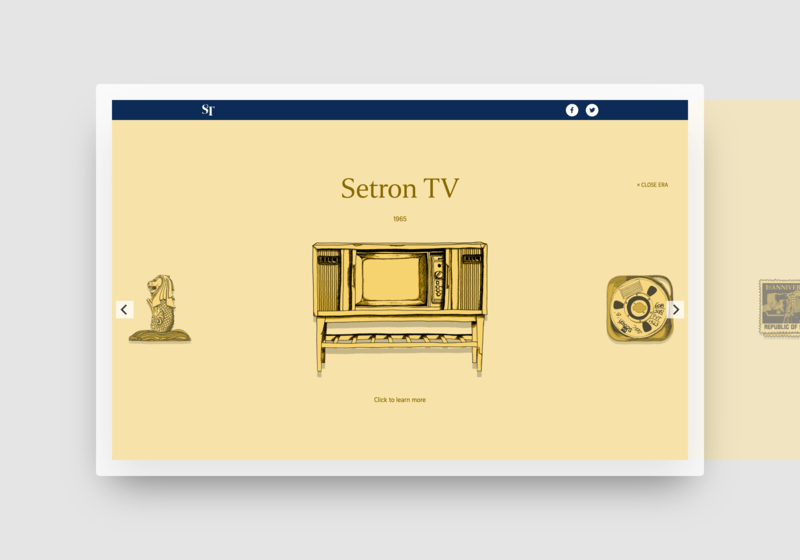 I’ve designed web and mobile products that are used by thousands of business owners and millions of consumers.